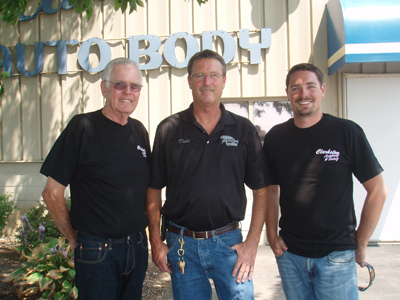 Clarkston Auto Body was founded in 1976 when Paul Verhey decided to follow his passion for cars and opened a small repair shop in Waterford. Joined by his recently graduated son Dale, they rented space in a building on Dixie Highway near Williams Lake Road in Waterford and began repairing whatever they could find. Within 2 years, business had outgrown the Waterford shop forcing the pair to build the current Clarkson Auto Body location in Independence Township on Sashabaw Road. Paul would completely retire in 1990, leaving Dale to run the business with his wife Carol. The next six years would bring a renovation and another expansion in the company portfolio. The second installment of this growing company came with the acquisition of Fat Keith’s Collision on Dixie Highway in Waterford in 1996. The intention was to make the Dixie highway location an overflow shop for the Sashabaw store. The Dixie highway store quickly flourished into its own self sufficient and profitable business. Fat Keith’s son, Steve, was hired on to manage the facility and is still employed by this company to this day. Now Clarkston II is managed by Brian Perkins, with a near decade of service. Part three of the Clarkston Auto Body saga has led Dale down a new and exciting path; a towing and trucking division. After purchasing a wrecker out of Clarkston Auto Body I, Dale pursued local towing opportunities and also used this vehicle to support the body shops. In 2003 this business gained the attention of his newly graduated son, Nick, who now runs all the towing and has extended it to nationwide transport & logistical services. The nationwide trucking is now its own division and bears the name Assured Carriers. Clarkston Auto Body’s success is attributed to commitment to customer service but foremost to make sure we repair cars and trucks the correct way. Dale and his father have always stood behind the belief that the stamina that’s been displayed through rough currents in the economy is substantiated proof that a satisfied consumer is the cornerstone of a long-standing and trusted presence in the community. Our staff consists of seasoned veterans determined to provide and produce a top-notch service & repair. It is with dedication to the traditions of this company that we will be of service to you! We are pleased that you have taken the time and have an interest to learn a little more about our company. If you should have any questions about our services please feel free to contact us!